Apple‘s recent earnings figures revealed how astonishingly well the company’s been performing–if its growth continues, it’ll be the biggest company in the U.S., surpassing Microsoft. From which products will all this money come? The iPad is the secret weapon. 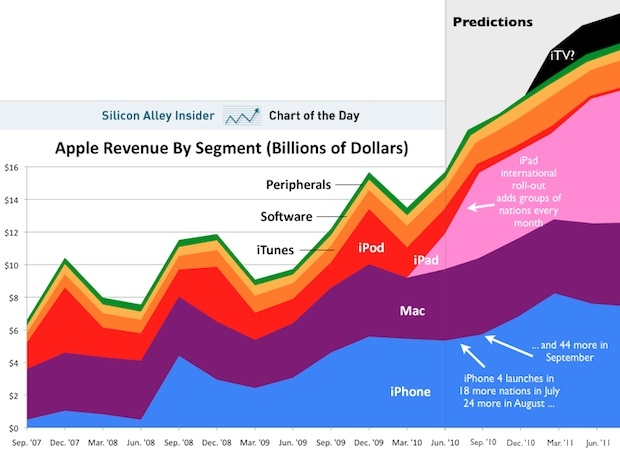 Silicon Alley Insider dug into Apple’s finances and split out the revenues into product sectors, including historic data. The iPhone sales figures have been slightly sliding recently, but still make up the largest product sector contributing to Apple’s overall revenues–and the figures for the early part of this year probably reflect some depressed sales as the public became aware that a radical make-over to the iPhone was due in the middle of the year. Tim Cook himself noted that the iPad wasn’t following a traditional “early adopter” model (with a slow but accelerating start as an initially highly-wary public slowly wake up to a new paradigm device, and then accelerate sales), but it was selling at an extraordinarily swift rate, even in its early market. This graph was so intriguing, that we couldn’t resist attempting extending it into the future. I stared into my crystal ball, admittedly with some “normal business” thinking–imagining that there would be no catastrophes, and assuming that Apple’s growth will continue on its current trajectory, which is a fair conclusion given how confident analysts are about recommending a “buy” on Apple stock. And I used data about upcoming product release dates, coupled with news that Apple’s Mac business is slowly accelerating, to guess the future. The prediction portion of the graph is on the right of the image. The iPhone sales will, I suspect accelerate throughout 2010 despite any early crunches caused by “antennagate,” and because Apple’s due to sell the phone in 18 new nations starting at the end of July, another 24 in August and 44 more in September. They’ll form the basis of Apple’s revenues for years yet. The big take-away is the iPad segment. It’s demonstrated phenomenal sales thus far, and has only been available in a handful of countries. Given its new-paradigm status, headline-grabbing success and the fact that no strong competitors have even begun to emerge (despite being promised), I think its sales will continue to accelerate, at least for the next several months as the device is rolled out internationally. And if this proves true, the iPad may become as significant chunk of Apple’s income as the iPhone is–just as the iPod’s share declines. The one truly speculative segment here is the revamped Apple TV, which we’ve heard about in rumors for years, but which has recently become something that seems very real (much as the iPad rumor news “felt” in the run up to its launch). If it launches, Apple may choose a new time of year for it so it doesn’t conflict with the typical upgrade cycles of existing products–we guessed that before or just after the holiday season may be a good time for this. And if it’s as clever as it promises to be, it might just ride on the early moments of the upcoming digital Net-TV wave and become a market-dominator much like its other iDevice predecessors. This is all just guessing, though. It may not prove to be a golden year afterall. Apple could stutter, its new products may fail, or a competitor may suddenly emerge and steal huge chunks of its market. We have to say the odds of this happening look pretty slim though. Our chips are on Apple.